I remember a few years ago my husband and I were talking and we saw an ad for Orange Julius and my husband mentioned he had NEVER had one before. Since I liked them I had him try one and he loved them. So much so he asked me to find a recipe to make at home. 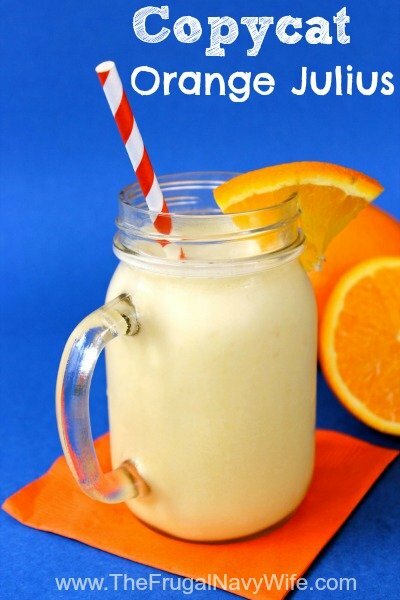 After a bit of tweaking we fell in love with this Copycat Orange Julius recipe and it's a staple in our house especially in the summer months ! This is super easy! Just put everything in the blender ( I suggest the Smoothie Smart Blender) and blend until smooth. Danielle — many (MANY) years ago at the Texas state fair, the original Orange Julius (and it must have been *very* early, as many people at OJ don’t even know about this,) was the juice of a fresh-squeezed orange and a big scoop of vanilla ice-cream. In fact, we had an older man from Texas when we lived there who used to bring oranges in from California by the truckload. I used to have fresh squeezed o.j. and vanilla ice-cream smoothies, as they’d be called now, for breakfast a couple days a week.